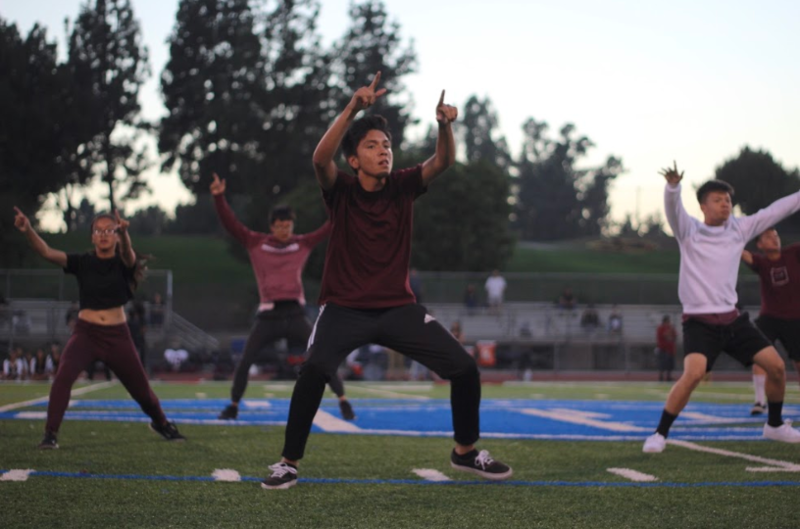 With their first performance at homecoming rally in almost five years, All Male gets the crowd excited with their latest routine as they danced to hit songs “Take You Down” by Chris Brown and “Sicko Mode” by Travis Scott featuring Drake. In addition to being their first homecoming rally performance in a while, the members of All Male felt nervous and excited to perform with their secret female guest, senior Vivian Nguyen who has been dancing with the team behind the scenes ever since her junior year and was given an opportunity to dance with them for homecoming rally. With only a few weeks after fall rally to get their performance ready, the members of All Male felt the pressure to deliver a routine that would leave an impression on the student body as they were not given the same amount of time to prepare compared to fall rally. The homecoming rally was also the first time that the current team performed on the football turf. Despite the pressure of having less time to prepare a routine, All Male is now aiming to perform at homecoming rally every single year.